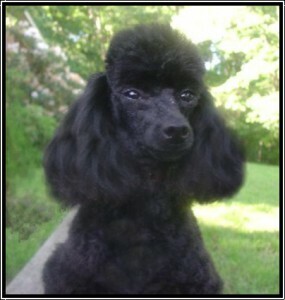 All poodles are intelligent and alert, but there’s something especially merry in the eyes of black poodles. These little rascals seem particularly playful and fun-loving. Though they can still reach the heights of elegance in a Continental clip, there’s something about black poodles that always seems unpretentious. Whether your poodle is meant for show or meant as a companion, he or she will quickly become part of the family. Poodles are extremely intelligent and easy to train. They don’t shed, which is an important consideration for people with allergies. They can get enough exercise from daily walks, so they are suitable for apartment dwellers. Here at Homestead Poodles, our puppies are truly home raised. From the moment they are born, they are under our watchful eyes and lavished with attention and affection. Unlike many other sources where people might get dogs, puppies are not just a product for us. Each one is an individual, and we care deeply about them all. Because they are raised in a family atmosphere rather than in kennel-type surroundings, our puppies will come to you completely socialized, and ready to become a part of your family. They have been exposed not only to other poodles, but to various kinds of dogs, cats, unfamiliar people and even kids. We guarantee our puppies’ health as well as their socialization. You will never get a neurotic or aggressive puppy from us. Our puppies know they are loved, and are loving in return.